SAMe Joint by Jarrow Formulas® is a dietary supplement with two active substances which ensure normal function of joints and protects them from injuries. The formula has an anti-inflammatory effect and improves the production of synovial fluid and consequently protects against degeneration. Glucosamine – a substance from a group of amino saccharides which are composed of the core protein and sugar chains attached to it. 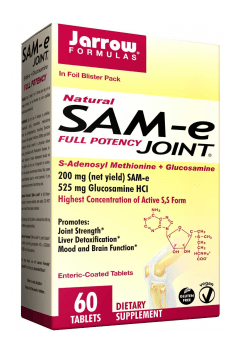 The main structures that are affected by glucosamine are joints and their cartilages. This is due to the fact that they are mostly built of collagen whose structure is reinforced by long-term glucosamine supplementation. Collagen synthesis decreases with age which results in joint degeneration and inflammation. Glucosamine slows down effectively this process and protects against inflammation. Owing to that, it does not only improve the function of the locomotor system but also improves skin elasticity. This arises from the fact that this active substance participates in the synthesis of proteoglycans. These are substances which ensure adequate hydration and nourishment of cartilages which are critical to their healthy structure. Glucosamine is characterised by a low absorption rate and that is why it is important to supplement it regularly. This allows you to reduce effectively markers that are characteristic of collagen breakdown. The active substance is characterised by high anti-inflammatory potential. The mechanism of this action consists in that it curbs the activity of cyclooxygenase-2 (COX-2) which is responsible for the synthesis of proinflammatory agents in the body. Owing to that, this substance reduces symptoms of joint inflammation – pain, redness and dysfunction. It is extremely important because chronic inflammation leads to permament damage to joints and cartilages which contributes to their degeneration. The amino saccharide is involved in the synthesis of synovial fluid that ensures normal mobility and shock absorption for joints and protects against their wear and tear. SAMe (S-Adenosyl Methionine) is a substance naturally ocurring in the body which is a source of methyl groups in metabolic processes in every cell. SAMe is considered a universal donor of methyl groups and is involved in many trans methylation reactions associated with various proteins, peptides, nucleic acids and phospholipids. SAMe depends from, among other things, bioavailability of folic acid in diet (its active metabolite contributes to methionine formation which is metabolised to SAMe) and also vitamin B12 and choline. Because of that, insufficient intake of these nutrients may be one of the causes of DNA hypomethylation, impaired neuron function and gene expression and abnormalities in neurotransmission of the central nervous system. Impaired DNA methylation may be correlate with pathogenesis of rheumatoid arthritis. It has been observed that SAMe can have a beneficial effect on reducing pain and increasing joint mobility. The efficacy of SAMe is comparable to non-steroid anti-inflammatory drugs. SAMe Joint by Jarrow Formulas® is a formula whose effects allow you to maintain normal joint function and health. Glucosamine and SAMe encourages collagen synthesis and protects against the degradation of cartilages which are responsible for healthy motor function. The supplement is designed for athletes who are exposed to joint injuries. In addition, the formula should interest the elderly, in whom collagen production is not very efficient, and persons recovering from injuries. In order to notice positive effects, it is recommended to take the supplement for at least 4 months. This is due to the fact that glucosamine shows smaller intestinal absorption. Because of that, it should be taken for a longer period of time to achieve its effective levels in the joint. The supplement is relatively safe and that is why we can increase its dose to enhance effectiveness. However, it is suggested to take it a couple of times throughout the day because a high single dose may lead to minor digestive problems. Cellulose, Glyceryl behenate, Medium chain triglycerides, Oleic acid, Sodium alginate, TItanium dioxide, Riboflavin, Stearic acid (vegetable source), Silicon dioxide, Magnesium stearate (vegetable source), Dextrin, Dextrose, Sodium citrate. Natural vitamin E from non-GMO sources.